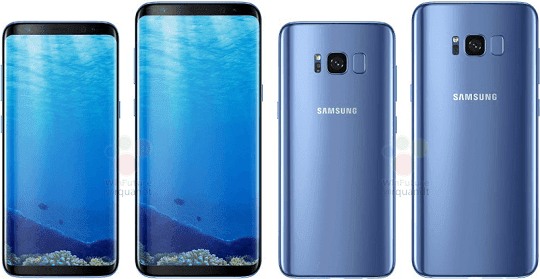 Samsung is still preparing for the launch of its latest Galaxy S8 and S8+ flagship devices on March 29 in New York, yet we're already seeing numerous leaks that give us an almost clear picture of what the actual devices may look like once they hit the market. Despite Samsung's efforts to prevent the leaks of its latest offerings, from a few specs to images, videos, accessories, and pricing, we now have almost all of the information related to the Galaxy S8 flagship duo. 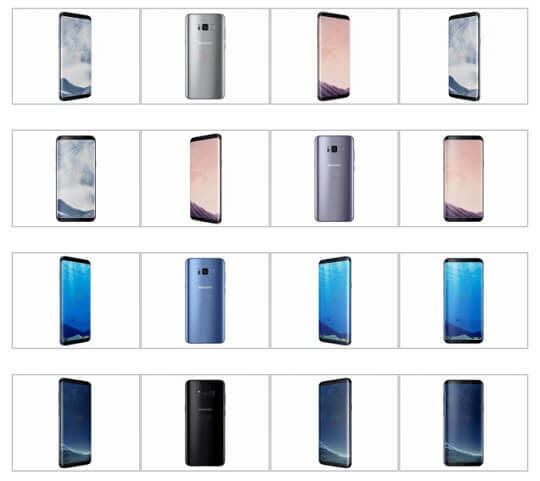 Most of the features of the Galaxy S8 duo, along with the images of all the color variants that Samsung is offering, are now being presented in full details, thanks to WinFuture. According to the new information revealed, the Galaxy S8 will sport a 5.8-inch Curved Super AMOLED display, powered by an Exynos 8895 or Snapdragon 835 processor, with 4GB of RAM and 64GB of internal storage. The Galaxy S8+, on the other hand, will feature a bigger 6.2-inch Curved Super AMOLED display, with the same processor and memory configuration as the Galaxy S8. In terms of battery capacity, the Galaxy S8 will boast a 3000mAh battery, while the Galaxy S8+ will come with a bigger 3500mAh battery. Both devices will have the same camera setup: a 12MP rear and 8MP front snapper. Both will also run on the latest Android 7.0 Nougat OS. In addition, Samsung will be offering a program called Samsung Guard S8, which will allow customers to have their phones repaired within two hours. Samsung might also let buyers avail the one-time replacement of the screen and a Remote Support option. Nothing has been confirmed yet, so we're all taking this with a grain of salt. 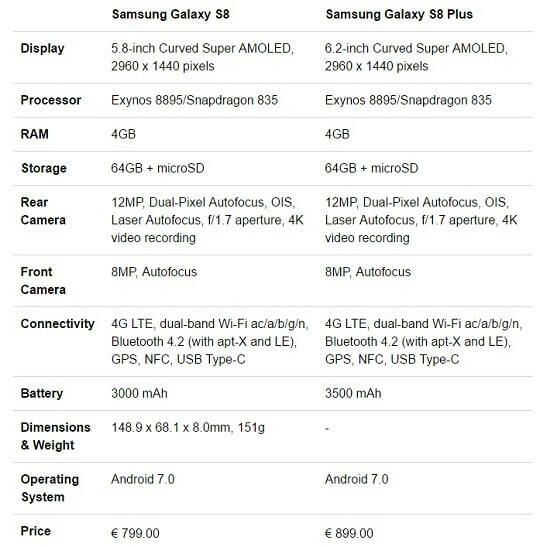 The Samsung Galaxy S8 and S8+, as previously revealed, will be priced at €799 (about Php43K in direct peso conversion) and €899 (about Php48.5K in direct peso conversion), respectively.